The four satellites of NASA's Magnetospheric Multisphere mission have set the record for highest-altitude GPS fix by checking in at 43,500 miles (70,000 kilometers) above Earth's surface. A NASA mission's GPS prowess is now part of the record books: The Magnetospheric Multiscale (MMS) mission just broke a Guinness World Record for highest altitude fix of a GPS signal. The four MMS satellites set the new space record by using GPS navigation at an altitude of 43,500 miles (70,000 kilometers) above Earth's surface. The satellites use GPS, which is a navigation system that pinpoints locations by checking in with devoted satellites in orbit, to stay in a tight flying formation as they survey Earth's magnetic field. MMS are also the fastest-traveling craft to use a GPS receiver, reaching 22,000 mph (35,405 km/h) when the mission is at its closest point to Earth along its orbit. 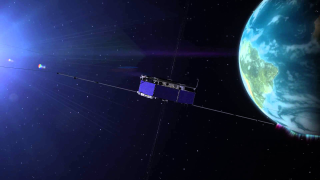 The primary mission of MMS is to help scientists understand Earth's magnetosphere, which is the region surrounding our planet where Earth's magnetic field is dominant (as opposed to the magnetic field of space itself). "The mission uses four individual satellites that fly in a pyramid formation to map magnetic reconnection — a process that occurs as the sun and Earth's magnetic fields interact," officials from NASA's Goddard Space Flight Center said in a statement. "Precise GPS tracking allows the satellites to maintain a tight formation and obtain high resolution three-dimensional observations." Studying magnetic connection helps scientists understand phenomena ranging from flares on the sun's surface to auroras in Earth's atmosphere, NASA added. The satellites will go to a higher orbit to look at a different region of the magnetosphere in spring, beginning Phase 2 of the mission. During that stage, the satellites are expected to at least double the GPS record they set, officials said.